We pray as a whole school to begin and end each school day. Each class also prays before and after meals, giving thanks for all the gifts bestowed on us by our loving God. Each week, we gather as a school community to celebrate Mass on Tuesday and Friday. 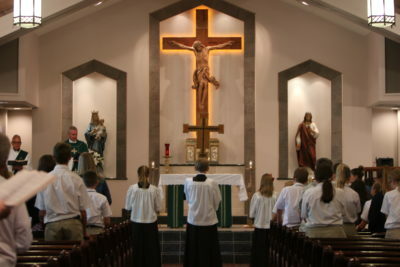 Teachers and their students take turns preparing the Mass. Students participate as lectors, servers, gift bearers, choir members, and student musicians. Parents and families are invited to attend mass each week to join us in song, prayer, and to praise the Lord together! Eucharistic Adoration is held weekly on Thursdays in our parish. Two grades each week attend, which allows every class to participate in Adoration one time per month. Being in the holy presence of our Lord is an experience that is valued and prioritized in our faith community. Each grade level is paired with another grade level, each year, in order to share prayer experiences. Once monthly, the classes meet together for various activities, getting to know one another, and to share faith through prayer. This year our school theme is “Discover the Saint in You” and many prayer partner experiences have revolved around learning more about the lives of the saints we are studying as a school. We are building a community of faith-filled friends! We celebrate the Sacraments as a community whenever given the opportunity. Our second grade students spend a great deal of time preparing for First Reconciliation in the fall, and First Holy Communion in the spring. We cherish this time and are all excited to see the transformation these young students experience, while fondly remembering our own first Sacraments. The Sacrament of Reconciliation is given to every class once each month. Our clergy at MQH stay connected to our students through the ministry of this and all the Sacraments. It is such a blessing to have clergy who are ready to share the love and forgiveness of our Lord so regularly. Our eighth grade students culminate their faith journey within our school by receiving the Sacrament of Confirmation in the spring. Bishop Foys visits, spends time with the class, and encourages them through his faithful example. It is a joyful celebration for all of us to witness these students grow in their faith by accepting the Holy Spirit and becoming full members of the Catholic Church.